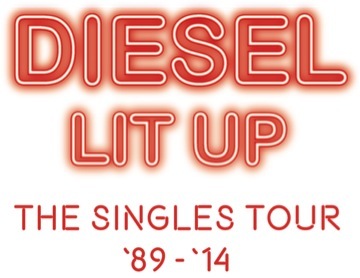 After 25 years of music making, DIESEL leaves his front door again to bring you DIESEL LIT UP – THE SINGLES ’89-’14. A tour to “look back at the sparks and smell the roses” of the accumulated singles that have etched their way into our music landscape. With over 30 singles and 13 albums, DIESEL has the fortunate problem of having to try and fit all of this in to a performance, a performance that is littered with milestones, with familiar songs taking on a new life in the uncluttered solo environment.